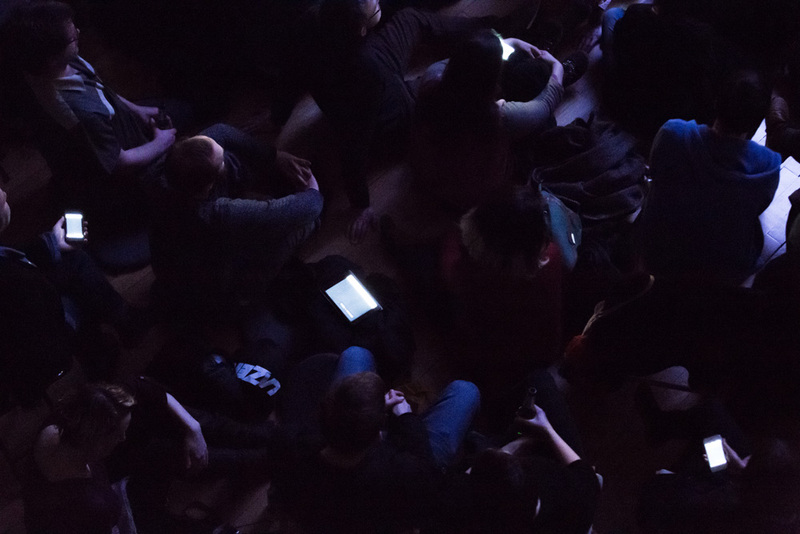 Murmurate is a site-responsive performance which uses the audience’s personal smartphones and tablets as a sound diffusion system. The composition, built specially for Sanctuary 2015, incorporates synthesized sounds and field recordings from the immediate surroundings of Galloway Forest. After collection, these sounds are processed, organized and performed through a swarm of tiny mobile speakers from the participants’ devices. The result is a highly spatialised sound piece with each audience member holding their own distinctive part of the composition. The collective devices create an array of overlapping and intertwined sensory experiences. As well as sonic feedback, each mobile screen is sound responsive, flashing from black to white each time a sound is heard. Murmurate explores the interject between sound and vision, gaining a unique perspective on the immediate landscape. A connection is established between people, the portable devices they always carry and the surrounding nature as it is plunged into darkness. Tim Shaw has worked internationally as a composer, performer, sound designer and researcher. His practice incorporates diverse approaches to sound collection and processing. Shaw’s compositional methods include field recordings, synthesized sounds and live electronics, providing a wide scope for creative diversity. Using DIY technologies to construct experimental instruments, installations and assemblages his work involves a direct engagement with the materiality of sound. Collaboration plays a central role in his approach, he has been lucky enough to make artistic work with many people including Chris Watson, John Bowers and Sébastien Piquemal. Tim has presented work in various international venues including Café OTO, NIME, CHI, NK Projekt, ZDB, and CTM. Sébastien Piquemal (http://funktion.fm) is a computer engineer obsessively exploring the artistic capabilities of machines. With a double background in programming and sound design, he has created sonic and experimental web sites, and is the author of several music open-source libraries such as WebPd (Pure Data for the web). His work focuses on the potential of new technologies, both in shifting the hierarchic structures in live music and create new computer generated sonic experiences, borrowing from the field of computational creativity. Sébastien is currently working and studying in Media Lab Helsinki, Finland. His work has been shown at a number of international venues and conferences, such as CTM, N.K., cafe OTO, NIME, ICMC among others.